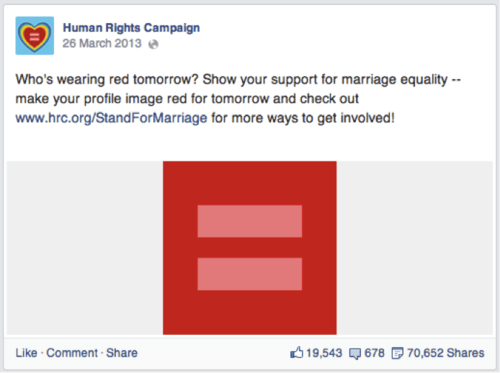 Marriage equality, Facebook profile pictures, and civic participation? The full case study was published as part of the Civic Media Project, edited by Eric Gordon and Paul Mihailidis. It’s a great project that brings together a huge collection of case studies to reflect on how people are engaging in civic life today. You can find our case study here. We look at the ‘variations on a meme’ in the HRC equals sign campaign, discuss how the meme was appropriated by corporations looking to associate themselves with the movement, before going on to play with the concept of slacktivism, and consider how changing one’s profile picture might figure into a broader understanding of ‘civic participation’. Tagged civic media, Civic Participation, facebookBookmark the permalink.